Diana Gould: ‘Grief Has No Nationality’ part 1. Diana Gould: ‘Grief Has No Nationality’ part 2. 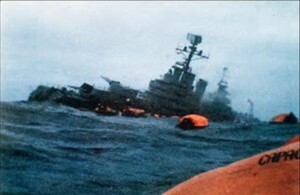 Simply quoting the figures given for the dead, missing and wounded in the Falklands War gives no inkling of the continuing tragedy of the lives of those affected. The families of the dead have had to learn to live without the husband, father, or son, who was killed 8000 miles from home. The maimed have had to try to make new lives, perhaps without a limb, or with tragically disfiguring injuries from terrible burns. Little is heard of those who suffered psychologically, but some men have literally, had to learn how to live again. The bereaved families of the British war-victims have been able to visit the far-away graves, but for the relatives of the Argentine dead, even that is denied them. The recent burial of a young Argentinian pilot, discovered in the wreckage of his plane, has highlighted this situation. His father and sister were allowed to attend the funeral, however in order to do so they had to travel to this country, and then to the Islands; 16000 miles when the distance from the South American coast is but 400. Mr Giminez would have liked his son to have been buried in his home town, but Argentina refused to repatriate the bodies of the War Dead, since according to them, they are buried on Argentine territory, i.e. The Malvinas. Whether it may now prove possible for other relatives to visit the Argentinian burial ground remains to be seen, but previous attempts have foundered over Argentina’s refusal to accept conditions and wording which it says imply recognition of British rule. In a correspondence I have had with an Argentine member of Rotary International, he has asked me if the Belgrano Action Group could ask the British Red Cross International to contact it’s namesake in Argentina and so pressure could be brought to alter that wording and make it acceptable? I had hoped to get some of the relatives to speak today: the ones I approached found it too painful to do so. However I would like to read to you the letter that came to me from this Argentinian Rotarian, but was written, to him, by the mother of a young British sailor killed on the Coventry. Dear Sir, thank you for your letter, received today via Oxford Rotary Club. Yes, I went to the Islands to pay tribute to the Memorials, especially HMS Coventry Cross on Pebble Island, and to the sea grave of HMS Coventry on which my son Ian, aged 22 years died. His loss was great to us, too much for my husband who became ill and died on January 29th, 1985 aged 53 years. Ian was our only son but I would like you to understand that we have never blamed the ordinary Argentine people for our sad loss. For you too know the pain of losing loved ones. I blame only the politicians, and I wish that they had talked together longer and not brought our two countries into conflict. It should not have happened. I wanted to visit the Argentine Cemetery to say a prayer for all those young boys who died, and for their sorrowing parents and other relations who must still feel such pain and suffering for the loss of all their young sons, as we do still ours. I hope it will be of some comfort to you all to know the Argentine Cemetery is in a very quiet and peaceful location, and the graves are well cared for, but I felt very sad that many were unnamed, and only had the inscription “An Argentine soldier, known only to God.” Many of those boys were so young, even younger than my own son. I remember reading somewhere that “Grief has no nationality” and this is indeed true, for we all suffer the same heartache. To all those who lose loved ones in the South Atlantic Conflict I pray you find enough strength to bear the loss and may you find peace in your hearts soon. After the War, the bereaved found a lack of humanity, confusion and poor organization in dealing with their needs and it took a campaign by a journalist, Jean Carr, in order to ensure that adequate compensation was eventually forthcoming for the relatives of the dead, and for the medically discharged. On the 4th Anniversary of the War earlier this year, members of the Malvinas Veterans Group which represents 6000 of the 8500 soldiers who served in the Islands, set up a protest camp in the Plaza of the Republic in Buenos Aires. The plight of some of them is distressing as the Veterans Benefit Bill 1984 had not been passed by the Argentine government and so former servicemen had not been given the tests they needed to determine what assistance they required to enable them to return to a normal life. And this is four years after the war. The Islanders themselves had had to learn to cope with the different situation from before 1982. Perhaps one way in which they, the Islanders have suffered is that their relatives have had to be brought to Britain when seriously ill, and some have died here, thousands of miles from their own families. The opening of a new hospital next year will alleviate this difficulty, but apparently the snag there is that the hospital is going to be extremely costly to operate. Since the war young servicemen have died in accidents that have occurred whilst they have been helping to maintain Fortress Falklands and such tragedies are bound to continue as long as we are keeping a large number of personell on and around the Islands. The establishment from next February of the ‘Falklands Islands Interim Conservation and Management Zone’ , the FICZ, of 150 miles, and the formal assertion of the government’s right to a Fisheries limit of 200 miles around the Islands, as announced at the end of this October, may possibly lead to patrols in hazardous weather and therefore to more casualties. I wonder if the Islanders realize the awesome responsibility that has been thrust upon them by making their wishes of paramount importance: when they hear of the vast sums that this country can ill afford, being spend on the Falklands; when they see pictures of the men terribly maimed, their lives shattered; when they think of the bereaved mothers and wives and the fatherless children, do they not realize that this is the price to be paid by others, not themselves, for the veto that their wishes effectively has put on any negotiations? I ask the question; Do they count the cost?